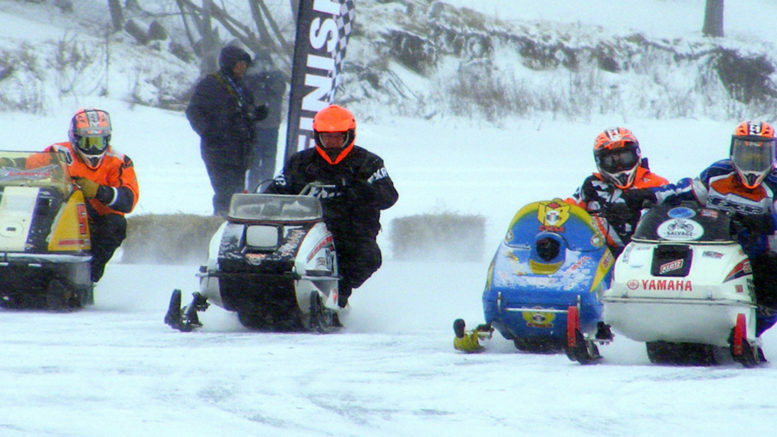 Snowmobilers live for winter, but Sunday proved just a little too wintery for even the most dedicated sled racers on the Jan. 19-20 weekend at West Lake. The Ontario Snowmobile Oval Racers kicked off their ice racing season by holding the Sand Dunes Cup, a series of races on the ice at Isaiah Tubbs, but after fighting the weather on Saturday, organizers made the tough decision to cancel Sunday’s event. However, racers are undeterred, he said. “It was a very good start to the season, and we want to come back next year with a little better weather,” Greenfield said. The group held its year-end banquet at Isaiah Tubbs in 2018, but this was the first time the group has held races at West Lake. The planned weekend event attracted several hundred competitors who came to race snowmobiles and ATVs. Greenfield said the event attracted people from northern Ontario and even from as far away as Pennsylvania and New York. Doug Zadow won the Mod Single Combo and Kyle Reynolds won Mod combo Y, while Larry Wilson dominated every Super Mod Class above 440cc. The OSOR, now in its third season, is holding races across Ontario every weekend in January, February and March. Races are divided into a large number of classes for a wide variety of machines and different age divisions and for different levels of experience. Some racers come just for one weekend or even just for one day, while others compete regularly to accumulate points toward year-end awards. The next stop on the circuit is the Polar Bear Cup in Cochrane on Jan. 26-27. The full schedule is posted on the OSOR web site at www.osor.ca. The OSOR currently has more than 2,900 members, and anyone interested in vintage ice oval racing is welcome to join. Sponsors also are encouraged to get involved. For more information, e-mail osorgroup@hotmail.com or visit the website. There is also a Facebook page for Ontario Snowmobile Oval Racers.